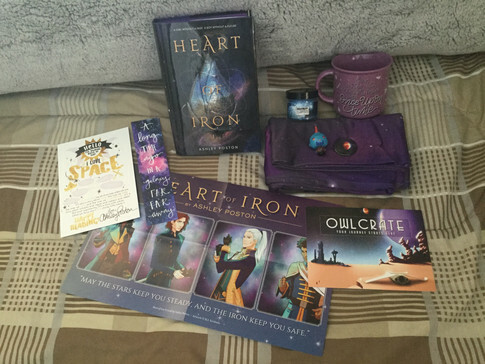 The March theme for Owlcrate was Across the Galaxy. The items included were a candle inspired by the Illuminae Files, a Guardians of the Galaxy Funko POP figure, a watercolor Star Wars bookmark, a Lunar Chronicles mug, a galaxy infinity scarf, a Red Rising print, the pin of the month, and a poster for the book of the month. This book of the month was Heart of Iron by Ashley Poston which is a retelling of Anastasia but in space! 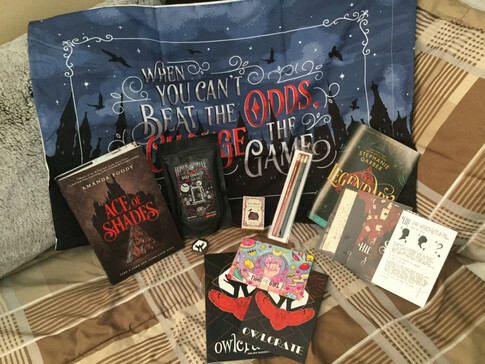 The theme for the April Owlcrate box was Shadows & Secrets. The items included were a Crooked Kingdom inspired pillowcase, Harry Potter quote pencils, some coffee from Bones Coffee Company, a Shadowhunters inspired soap, a sneak peek at Legendary, the sequel to Caraval, by Stephanie Garber, the pin of the month, and postcards that go with the books. The book of the month was Ace of Shades by Amanda Foody which I've heard is a little alike to Six of Crows which I am all down for! So there's a quick unboxing of the March and April Owlcrate boxes, and the next one will be coming soon so stay tuned!